"Keyboards in all their states: virtuoso, technically impeccable, "Wired For Madness" lacks the sensitivity to fully touch." While Dream Theater's latest opus has just landed in stores, Jordan Rudess, the band's keyboard player, has released his 15th solo album ("Wired for Madness"), in a more conventional form than his previous opuses, calling up some big names for the occasion: his friends James Labrie and John Petrucci of Dream Theater, drummer Marco Minnemann who had been auditioned for the replacement of Mike Portnoy, and Vinnie Moore, Joe Bonamassa plus Guthrie Govan as luxury guitarists (the latter having collaborated with Rudess in 2014 on "Explorations"). A lot of beautiful people! With such an team, the quality of interpretation suffers no criticism. The master of the place exposes his keyboards with masterfulness, to the point that the album could be subtitled "the keyboards in all their states": futuristic synthesizers, classical piano, jazzy piano ('Off The Ground'), organ, chords, copper tones ('Just Can't Win'), everything goes through it as if in a carefully presented catalogue. The relationship with another great keyboardist, Keith Emerson, is often striking, reminiscent of 'Tarkus', 'Pirates' or even some of The Nice's works... The guitars are entitled to their soloist interventions (excellent passage on the end of'Off the Ground') and the voices are present, used sparingly in both titles (the central female intervention in'Pt. 2' is aerial and very welcome), more prominent in the two more FM ballads ('Off the Ground' and'Just For Today'). Marco Minnemann's drum set, precise and aerial ('Perpetual Shine'), is in an ideal balance (much better than the mechanics put in place in Dream Theater...). The pre-eminence left to the keyboards explodes in both parts of the eponymous track, which aligns the pieces of bravery with a demonstrative virtuosity without any real thread, but leaves emotion aside - that is the risk of this kind of production. Even if these pieces do not suffer from any downtime except for a few atonal touches, even if the transitions are skillfully neat, the exercise does not escape the demonstration, even in short titles like "Just Can't Win", studied to make the soloists shine. 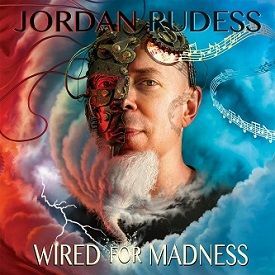 Music Waves was fortunate enough to be able to talk to Maestro Jordan Rudess about his burning news between the release of his solo album "Wired For Madness" and the release a few weeks earlier of Dream Theater's album. Keyboards in all their states: virtuoso, technically impeccable, "Wired For Madness" lacks the sensitivity to fully touch.